DLP and LCD are the types of DVP (Digital Video Projection) technologies used for displaying the computer screen over a large LCD screen or wall. The main difference between DLP and LCD projector is that the DLP works as a reflective technology while LCD is a transmissive method. Furthermore, DLP is more latest technology as compared to LCD. Colour production Immaculate colours that are acceptable for their brightness. Adequate colours and accuracy settings available. 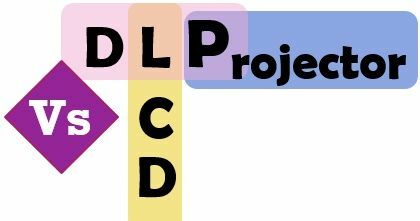 The DLP (Digital Light Processing) is a reflective projection method that merges a microelectrochemical system (MEMS) and projection display with the help of Digital Micrometer Device (DMD) microchip. The peculiar microchip is constructed by MEMS array of semiconductor-based digital light switches that accurately control a light source. 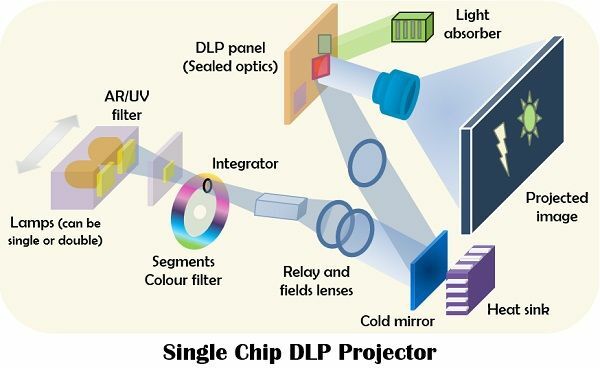 The DLP projector is built by digital light switches used in DMD chip are of tiny size approximately 16×16 μm mirrors (one mirror each pixel). Here each mirror is hinged and flips between two angles. The first angle reflects the light to the projection aperture producing in a bright pixel. As the other angle reflect the light away from the projection aperture generating a dark pixel over the screen. The grey scale is displayed by flipping the mirror fastly between the two angles about thousands of times in a second. The standard DLP forms the black and white chips, but if someone wants to produce colour images one of the two methods can be applied – single-chip or three-chip. These methods single-chip and three-chip use different components. The single chip uses single DLP and places swiftly spinning colour wheel between the DMD chip and lamp. Although, in the three-chip method, three distinct DMD chip for each primary colour is placed which produces an image by converging it. LCD projectors are constructed using the tiny liquid-crystal panels where the transmission of light takes place instead of reflection. It uses three panels for each colour. However, a fourth panel can also be used for enhancing the colour generation. The main work of the optical filters is to split the white light from the lamp into three colours (red, green and blue) and direct them through their respective panel. The LCD projector forms an image by sending varying electrical signals to each pixel in swift succession. This could produce two probable outcomes, in the first result, the light is transmitted through the LCD panel generating a bright pixel on the screen. In the second scenario, the light is absorbed through the panel producing a dark pixel on the screen. The positioning of the projected image must be on the same place over the screen which is assured by enclosing a prism by red, green and blue panels. The DLP projector projects the object over the screen by reflecting the light. On the contrary, the LCD projector transmits the light in order to produce the object on the screen. LCD produces a wide range of colours appropriate for video playback whereas DLP generates sufficient colours and which are adjustable. 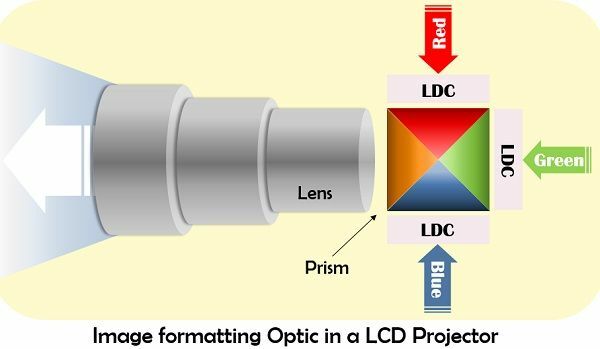 Visibility of pixels in LCD is better than that of DLP because the pixel positioning in LCD is in a manner which creates large gaps between the pixels. The misconvergence is the colour fringing effect produced by horizontal and vertical lines, which can be seen in LCD frequently. This occurs due to the misalignment of the different panel images. As against, this is not present in a DLP projector. Both DLP and LCD projectors have their associated advantages and disadvantages where DLP projector is suitable when users purpose is to display data with low-cost investment. On the other hand, for displaying immaculate colour reproduction for video playback, the LCD projector suits better.